My central defenders and central midfielders are closing down too much resulting on them being pulled out of position. Opponent had un deep runner who exploited this space. My left defender made a mistake and their right winger could receive the ball. How to fix all this, no idea. Can you show how you played this specific match with pi's if you used any? CM (d) have a close down more instruction by default, from my observation this is the last thing you want on a 4-4-2 from one of the most important mans in your foramtion. I would switch it to CDM (s) with hold position instruction instead of playing the CM (d), you can also add some instruction to the CM (s) that holds position if you want him to play the way you want him to play. I did that. I also tried with cm-de Pi close down less. Nothing. Absolutely whatever I do the pattern is the same. At some random point (understand random as "whenever", I know there is a cause), I start conceding an outrageous amount of goals and I can never a again have DECENT (I'm not saying good, I'm saying DECENT, not being sacked) results. You see how, for some reason, I start conceding like there was no tomorrow. Own goals, comical rebounds, set pieces and long shots basically. can you show the last 2 match states that you played ? I also sturggeled at the start but i understood what mistakes i've made. basically not usint pi's and ti's will lead the AI playing the default way and not your way. (not sure i describe it in a proper way in english). + would you mind to shortly tell how you want to play? (i know there is a whole discussion here, but it will be hard for me to find the way you want to play). I don't know, it seems to me from that specific highlight that your team sits too deep and it is pinned back and your players do not have a good day/cannot handle the pressure of the opponent. You play Levante and from what I see, they have commited only 4 men forward, two sit deeper, while you have about 7 in your own half. You should have absorbed the pressure, instead your team fails to contain. I might be wrong, I understand it is the type of football you want to play, but you have to make sure you have the right players at disposal to pull it off. I was like you before, I tried to win every game regardless of the opposition and when I did that, I had no idea if my changes actually affected the result or it was just what it was supposed to happen. I was unsatisfied even if I was hammering the opposition. Try to think in more simple terms. I think you need to understand your tactic very well to make the needed changes you talk about. 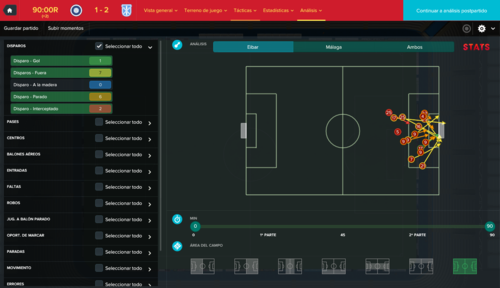 For example, the 4-4-2 can be easily overwhelmed in the central area, in that case, how can the 4-4-2 adapt so it can get through (in case of a strong opposition). If your opponent is weaker, try to spot any weaknesses in their formation/play to exploit it rather than adapt to counter what they are trying to exploit in your tactic. Just my thoughts. I want to sit deep and exploit the space left behind by the opponent. If the opponent plays attacking, great. 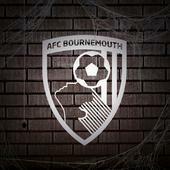 If they don't want to attack, I'm open to adjust my tactic and try to take control of the game. In fact, I'm doing this quite successfully. - "Roles". I want 2 fb (not attacking) 2 cb, 2 guys down the flanks, 2 central midfielders (1 creator the other destroyer) an attacking midfielder/withdrawn striker and an scoring striker. I don't care about the roles, for instance, I accept my creator is a cm-su or a dlp-su, even a BBM. My attacking midfielder can be an AM, T, AP.... My scoring striker can be any role in attack duty (I don't want a supportive striker). - Pick a big team such as Barca, Real, Bayern, Chelsea, Man U/C etc. It can be a good place to start when trying to understand concepts. - If things don't work out and you come here for help, people can offer specific advice about a specific style that you want to achieve. With all this done, what else can I do? Be realistic - think about the team you are, where they rank in the league, and adjust your expectations accordingly. There is no divine right to exceed expectations, so don't beat yourself up about it when you have a run of defeats. The bigger picture is where you end the season - it's a marathon, not a sprint. So you mean I must accept that after some games I will start losing until I'm sacked and nothing can be done? Because this is the case. What is needed to be understood is that at some random point I start conceding an outrageous amount of goals and I can never a again have DECENT (I'm not saying good, I'm saying DECENT, not being sacked) results. So I add to the list be realistic. With that done, what else can I do? After the first two losses, what did you do? How did you approach the following matches? The first 2 losses were, in my opinion, bad luck, especially against Athletic. They had 2 shots on goal and scored 1. I had like 4 ccc and 3 hc but didn't score. 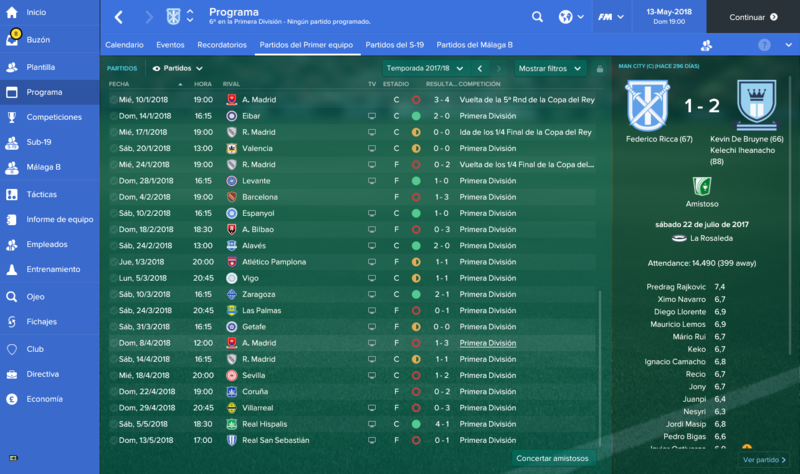 So, after that 2 losses, I started with the same tactic against Alaves. They quickly score one goal so I go from counter to control. I score. They switch their formation to attacking 4-2-4 so I went back to counter. I scored 1-2. I stayed on counter. They scored 1 and kept the attacking 4-2-4. They scored another and they came back to their initial 4-4-2 so I switched to control. 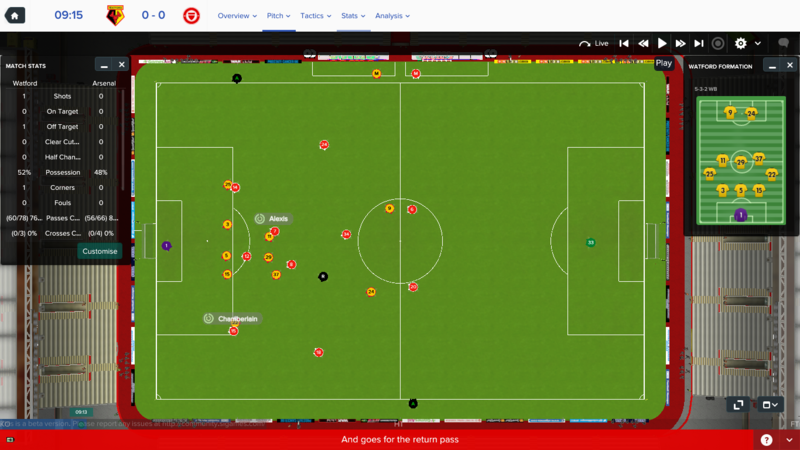 Against Celta, they started very attacking, creating a couple of ccc so I switched to defensive. They continued creating chances until they scored 1. I went to standard and they scored another. I went to control and they scored another. Half time. I went back to standard and scored 2 goals in the last 10 mins. Depends WHEN that is happening? 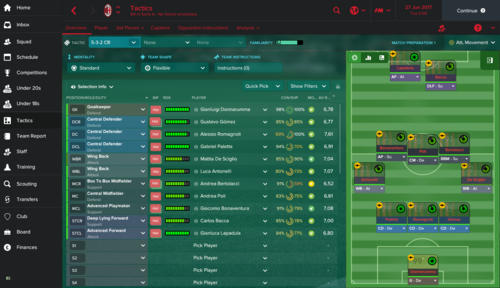 I think the main skill in FM is recognising that the opposition plays differently depending on how it views your strength, and that its important to adapt to that. I've noticed I now need to adapt during games far more than I ever had to previously. So if I've just gone on a 8 match winning streak that puts me in the top 2 of the league suddenly teams are sitting back and defending. So I cant push up so high and need to adapt. I can't win games in the way I did before and I'll get killed by pace. So it needs a rethink. That sort of thing happens ALL the time. I think many people still live in the plug and play mindset, which isn't applicable any more. In this first games, I started with my counter fluid tactic and, during the match, adjusting mentality (counter,standard an even control) managing if I wanted my players to take more or less risk. I perfectly remember the game against Las Palmas. Around min 60, I was 1-2 down. They changed to a defensive 4-1-4-1 but I changed mentality to control and dropped my def line. 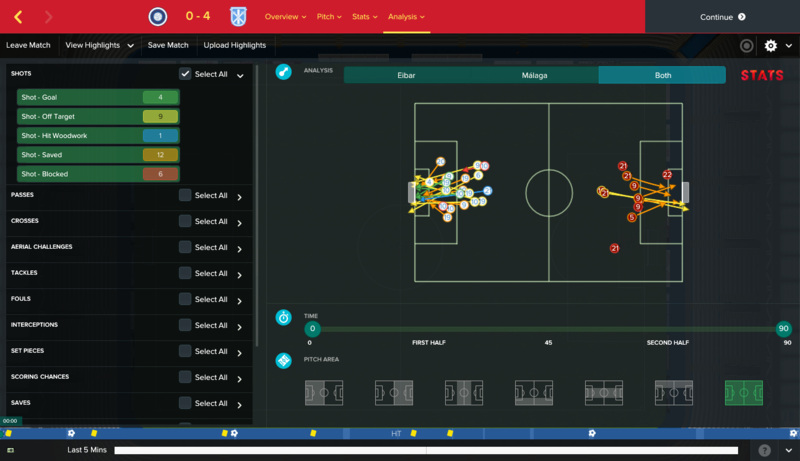 I started to create chances and finally scored two goals (that well could have been 3 or even 4). I do exactly the same. I adjust mentality and this is very important teams are not playing more defensive (at least, not more than 5 or 10 matches before). I perfectly remember how Coruña started with 4-2-3-1, which is not exactly a defensive formation. The same for Villarreal, Sevilla. Not to mention Madrid and Atletico Madrid (two matches which I expect to lose so I don't even care). In addition to that, if my problem was opponents playing more defensive what I expected to happen is scoring less, not conceding this outrageous amount of goals and still scoring more or less the same, especially because I'm not hit on the counter. I can even go to defensive mentality, structured shape, I can keep players behind the ball but I still conced an outrageous amount of goals. I'm not saying you are wrong, what I'm trying to say is that I don't detect any signs that make me think that I'm leaving space behind to deep opponents. I would say the opposite. Again, I'm not saying I'm right. 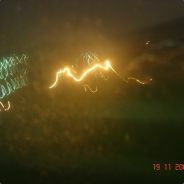 I just want to understand why, if it is the case, I'm getting the inputs from the game wrong, what I'm missunderstanding. not saying you are wrong, what I'm trying to say is that I don't detect any signs that make me think that I'm leaving space behind to deep opponents. I would say the opposite. So too much space in front of you? Like you need to press more? Though I don't want to suggest that because from the videos I thought most people agreed there was too much pressing going on? Yes, most people agreed too much pressing going on, but it's quite difficult to understand (I'm not saying they are wrong), because of my mentality (counter) and the absence of Pi (only cm-de who has by default close down more). I dropped closing down for both my cm and the same happened. It has nothing to do with pressing in my opinion, if anything it could be the players aggression attribute which is perfectly fine because you want your players to put pressure on the opponent, not leave him take his time to consider the options he's having. 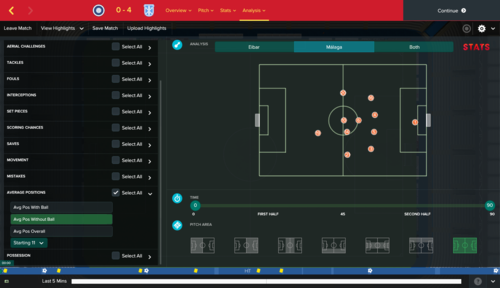 In my opinion if your tactic worked in the first matches and you got results, then it started to crumble, it's not exactly screaming major changes, but more like everyone said, minor changes. It wouldn't have worked if it was bad. I'm thinking like this. If you had good results, you climbed up the table and I recall you being 3rd at a point so maybe more relegation threatened teams started to play more cautious against you. My first opinion of that particular highlight against Levante was that you wouldn't get many chances to counter as they didn't commit more than 4-5 men forward. Considering that, if you recover the ball, you've still got 4-5 players left to beat and if they are positioned correctly on the field, you won't be able to trigger a counter-attack. So how can you make them commit more men forward so you can launch counter-attacks? You've got to watch that and see if there's a pattern in less quality teams and how bigger teams play against you. My guess would be that less quality teams would commit less men forward and sometimes still beat your defence and while you recover the ball you can't trigger counter-attacks because your players can't beat their still numerous defence. Now, while you still want to keep your principles at base, you gonna have to be ready to make changes in your system. I perfectly remember how Coruña started with 4-2-3-1, which is not exactly a defensive formation. Don't get caught into thinking that it is only the formation that indicates whether a team is attacking or defensive. It's much more than that. Teams will commit fewer players forward, play safer and deeper. They could still have been defensive even if they used a 4-2-3-1. Conceding three goals now and then is not outrageous by any standards whatsoever. Out of curiosity: how do your possession stats look when you lose? I also play a 4-4-2 counter which works as intended when the opposition has more possession than I. 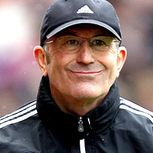 But if the opposition lets my team keep the ball, my 4-4-2 becomes totally useless. My backup plan is a possession oriented 3-4-1-2 (control flexible) that usually gets the job done against those nihilistic ultra defensive teams. Bingo! A plan to play when they give you the ball is the most important thing when you're in a good run. And if they see that giving you the ball, they win the game, everyone will start doing this. Scouting works for AI. Woud you be worried about this? Do you think my nº14 cm(su) is too high and this can cause so many shots? Is there anything wrong in this chance? Can I do anything to stop it? Lol dude you've won 4-0, I think you're overthinking/overreacting the whole thing. In a word, no. The most likely explanation is that once you score a couple goals, your opponent starts playing more attacking. Have you considered uploading your save from when you were still doing well so that someone like @herne79 can take a look? Looking at the shots chart, I can't see anything to worry about. The only thing I'd want to check -- how many of your shots from outside the box came from free kicks? I'd only see a slight concern if all 11 come from open play. Then I'd watch those shots to see why. Given the style you're playing, I feel comfortable saying that if you're getting too many long shots (and remember, that's still a big IF until you dissect the stats) it's because a forward player runs out of other options such that shooting becomes the safest choice. Your video doesn't show players (for me, at least) only their shadows. Really hard to tell what's happening . And how do you know what caused too many long shots? You watch the highlight clips of the long shots and you see why it was taken. More often than not, a long shot is taken because the player does not have better options for a pass or a dribble. You see where your other players are in relation to the shooter in the highlights. BItner is right if you are attacking or creative, you will see more because you are allowing the players to take more risks, and that includes chancy long shots. Even so, they will still typically do it when they perceive it is the best option within the tactical constraints you have created. If you are using retain possession, for example, or work ball into box, you will see them less likely to do it, or pass back to recycle. So remember what you are asking the players to do to start with, then watch the clips. Watch it a few times, focusing on a different player. You lose possession on offense. No problem here since all but one of the opposition have been pushed deep. Long, quick pass to opposition forward who has dropped into the space between your d-line and m-line. Misplaced pass ricochets back to opposition CM who lays it off to the opposition outside mid. Opposition mid finds center mid in acres of space. At this point (13 seconds in) you've got 7 defenders behind the ball vs 4 attackers. But here's where the trouble starts. Jump forward a second. While the numbers still look good, you've got both your DCs marking man-to-man. Your more defensive CM has recovered deep and is now stepping out to close down the ball. Your more attacking CM passed his runner to a DC and is closing down the ball as well. With the time on the ball, the ball carrier capitalizes on the open passing lanes finding a nimble striker isolated on your lumbering DC. Your GK gets beaten near post for the goal. So what do we take from this tactically speaking? Bluntly -- very little from this single event. Your defense was flooded down the right on a counterattack when a more fortuitous bounce ends it before it begins. Perhaps the GK could've done a little better, but that's at the individual level. If you see this type of goal repeatedly, there are a few things I would consider. But, and I can't stress this enough, do not overreact to a single goal. The best defenses in the world concede .75 goals per game on average. There is no perfect way to defend. Beyond a certain point, you're simply trading one weakness for another. That's the beauty of football and why tactics are so closely entwined with players' strengths. Assuming this is a repeated issue, you could use faster DCs, make your outside backs more defensive, drop the defensive CM to a DM, or look for tweaks that would get your CMs to close down the ball carrier or deny him space. Personally I would lean towards the latter since your intention is to sit deep (which that puts more emphasis on your DCs winning headers) and restricting your outside backs more may stunt your ability to recycle possession on offense. But again, there may not be the need to change anything! Look at all the goals you concede for trends before making adjustments. So, basically, whatever I do I will conced so I have to focus on scoring more? 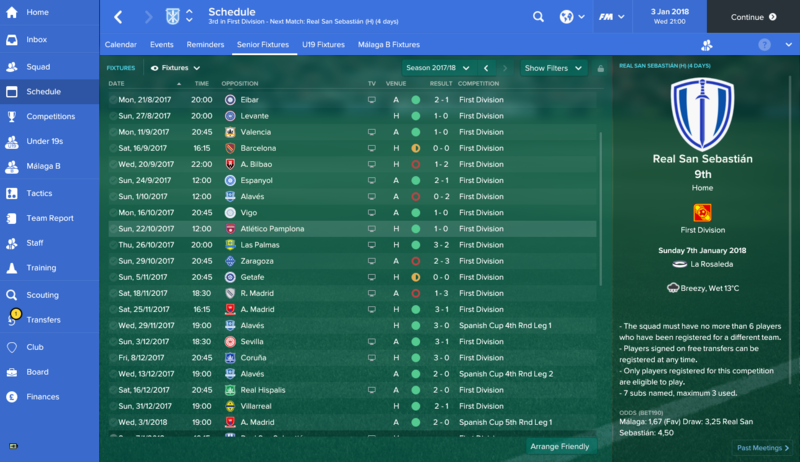 If this is the case, I'm done with fm. No, whoever said that? Yes you will concede goals- you cant have a clean sheet every time out and if that is your expectation, then you WILL be done with FM because it won't happen. If you are giving up goals because another team is better than you or their tactic is suited to undo you, then yeah, you might have to open up and chase the game. What is so wrong with that? It happens every day wherever soccer is played. However, you can limit the goals you give up. I'm disappointed by this response. @Ceching You Out has given you a great synopsis and that's your reply? You've either failed to read the post properly or failed to understand it. Either way, you need to re-read it slowly and properly. If you still don't understand, then ask. The post has got nothing to do with focussing on scoring more because you're going to concede. Probably I didn't use the best words. b) As long as, normal stats say that I "must" conceed at least 1 goal per game (more or less, understand what I mean), in the next 13 matches I will conced around 20.
c) In mid-long term, my numbers will be "normal", whatever I do. You've managed to respond to a lengthy, detailed response to a question you asked by taking a few lines out of context (and horribly butchering the paraphrase at that). I sincerely wish you the best, but I can't imagine how you're going to succeed when you are so depressingly pessimistic about your chances and bizarrely unrealistic in your expectations. We've been over this before -- in the last century plus the best defenses the world has ever seen in top flight football leagues still conceded nearly .4 goals per game. Read that again -- that's a decidedly non-zero number. If you think that you, struggling with tactics as you are and playing with a mid-table side with mid-table players, can approach that number playing FM, your expectations are horribly misinformed. If you're unwilling to acknowledge this, there is no helping you and I would strongly discourage others from their attempts. Some games you will concede a goal. Full stop. Because that's how football works no matter the club, no matter the players. Whether it's a mistake or a moment of brilliance, events will occasionally align such that the ball goes in your net. FM replicates real life in that way. The goal in defense is to minimize the chances of that happening because you can't make the probability zero. You resist this idea, thinking you can stop every goal. It's madness. There is an opportunity cost that comes with each tactical decision. Sitting deep invites pressure, stepping up leaves space behind. Playing wide lightens the middle, congesting the middle cedes the wings. Tactics are about matching the qualities of your squad to a style and your vision, whether that's maximizing strengths or minimizing weaknesses. Your approach has been akin to wanting to win at basketball without giving up a basket or at chess without losing a piece. That quite literally does not happen in professional matches. Sad to read what you say. I would be honoured if you kept posting here. In addition, the problem is not conceding, the problem are the number of chances the opponent creates. For that reason, I suppose, at some point, I'm lucky no longer and I start conceding. The question I was trying to make is: can I do anything to stop this? Or this is normal? To be honest, my last posts are a load of nonsense. I want yo publicly apologize for that reason. I'll come back with more constructive posts. I really think the main problem that you have to fix now is your expectations.. You are training Malaga, and the last time I saw it, you were doing good. I think that you want to play the game in a way that you will always find a way to win and rarely conceed goals. But that would make the game very unrealistic. If you are playing weaker teams, you can in some games win or draw against Barcelona, but with some luck, a bad game from them, etc. If barcelona wins 2-0,3-0, 4-0, you are not necessarly doing something wrong. And Barcelona is only a example, there's plenty of good teams on La Liga. I think you really should accept that there's games where you will conceed some goals, that as good as your tactic knowledge is, sometimes opposition players are just better. From this moment, this is going to be a complete disaster. 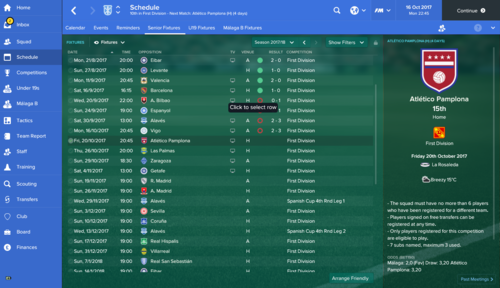 No matter what I do, I will conceed in every match and I won't be able to win more that 5 games until the end of the season. I know because it happens in every save. 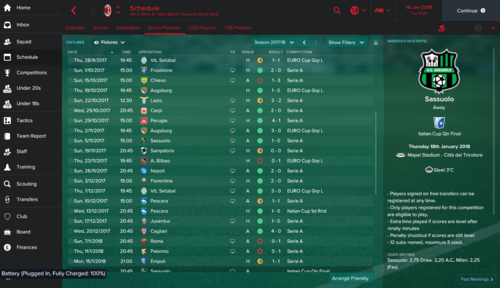 In this save we can't say I have unrealistic expectations: I want to end top 3 with Milan (I will end around 7 position). And we can't say "you are doing so well that teams now sit deep", because I'm Milan and this was happening from the first moment. Based on previous, I'm betting it is the insistance to stick to fairly positionally disciplined full backs coupled with the attitude to stick to that no matter what. On FM, wide midfielders narrow in front of the goal eventually, so not having a wide back going all the way all the time means no passing lanes out wide. He's playing a quasi 4-2-4 anyways, with both of them basically immediately becoming widish forwards (all based on what was posted previous). When that happens, all they can play through is the centre, which means in particular AI formations packing that and dropping deep have all those guys covered. Additionally, they aren't any positionally stretched, as then there is no pass on that would cause them to shift over anywhere. What follows is additionally long shot decisions, naturally. Granted those wide guys here are really narrow as by the shot, but the point is that only an advancing back really would cover that area far out wide consistently (unless he were manually tweaked to "sit inside"). 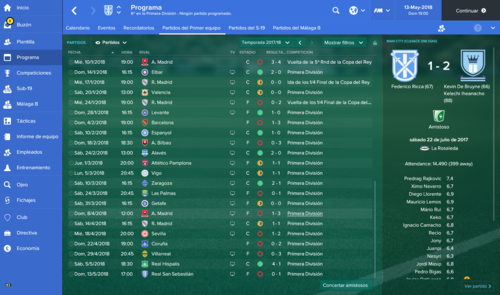 This was actually off FM 2013, which shows how consistent the game has been here either way. In the end it doesn't matter if players on a micro level behave 100% like in football, if defenders have only a small area to cover (draw a circle around the players actually advanced in both of the shots in this thread) then that should be easier to defend and mark and so it is, has always been. It was spotted against Watford (page 2), however simply further went with that way "because I didn't want to have a really aggressive wide back" and a "go wider" instruction tried as a half-assed workaround. In other words, this was fitting round pegs into square holes even though despite arguing how he was struggling to read what was happening in basic terms it was actually identified as such, judging by the process of detailed match analysis gone through step by step. None of that were a problem if he would have "played for a draw" or defending an actual lead. Then that lack of even the most meager of attacking risk would be understandable. As is stands there is consistently neither rhyme nor reason to anything of it, also based off previous threads, general expectations, anything, so it speaks to reason that the same would apply to the results, eventually. AI opponents obviously have limited awareness of where there is actually space, however they don't face such so rigidly because their duty and role assignments are dynamic and visibly shift not only from match to match, but during the course of a match. They may have both wide defenders on d-duty outright and not a single guy if at all on attack duty, that's how they grind out their meagre 1-0 luck wins (certainly not by encouraging wingers to push up ASAP basically playing 3 forwards for 90 minutes), however at reasonably attacking they typically mostly have one FB on attack who goes that wide distance consistently too -- and eventually is an outlet out wide, which the RM/LM in the final third typically are not. My argument was that if he went with a super simple entry level guide, he wouldn't do have anything of this, no matter if he watched extensively or not. They have his backs covered for stuff like that. I still go with that. There's thousands and thousands of players who flip through match days very casually. It likely is the majority of them. This forum represents a niche within a niche. You can holiday and give it to the assistant and I'd bet money he wouldn't face this literally every time. There is only one common denominator here, and it's not the game. Making this sound slightly harsh on purpose, as either this is snapped out of, which might mean their might still be some enjoyment in there. Or it's time to hang up those boots for good (also better for the nerves, probably). I'm betting it is the insistance to stick to fairly positionally disciplined full backs coupled with the attitude to stick to that no matter what. On FM, wide midfielders narrow in front of the goal eventually, so not having a wide back going all the way all the time means no passing lanes out wide. He's playing a quasi 4-2-4 anyways, with both of them basically immediately becoming widish forwards (all based on what was posted previous). Ok. THen I want my wm (or wingers) to huge the touchline all the time. Is this posible? I can understand if the opponent plays more defensive to lose 0-1, 1-0, draw 1-1 draw 0-0. But this is not what happens. What happens is that I start conceding an outrageous amount of goals. Yes, I score a bit less, but that is not the problem. The problem is that I conced a lot alot more. You can check it in any of my result series. My argument was that if he went with a super simple entry level guide, he wouldn't do have anything of this, no matter if he watched extensively or not. They have his backs covered for stuff like that. I still go with that. Against my better judgement, I tried playing with one fb on attack and the same happens. 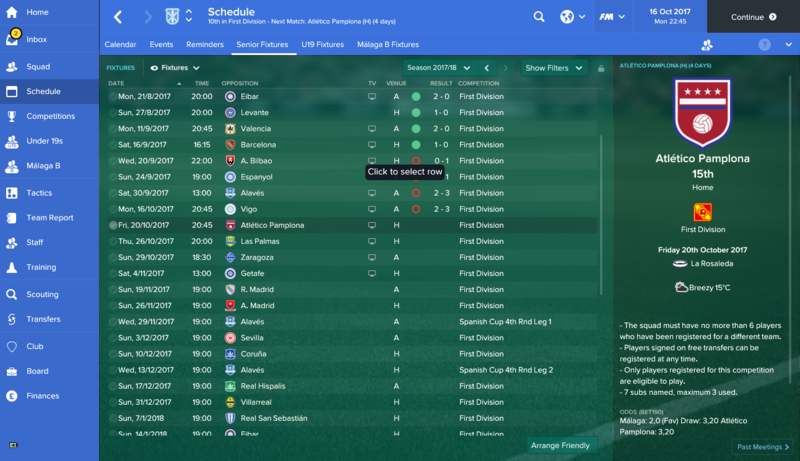 At some point, I start conceding an outrageous amount of goals and nothing can be done. To be honest, if a tactic without any attacking fb it's imposible to work, then the game is wrong. I want to think I haven't found the way to do it yet. I say it because every weekend I see many many teams that don't play with attacking fb. They don't have one wide midfielder cutting inside. They have 2 wingers, two dribblers and/or paced players. 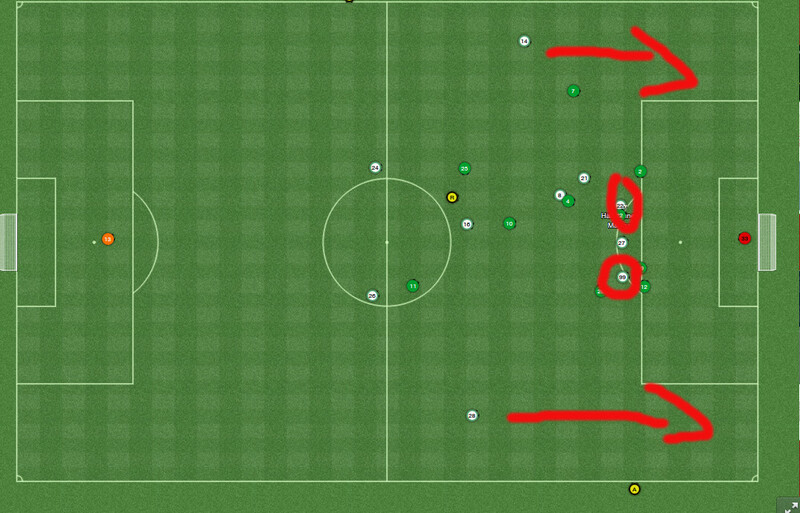 Yes, fb help creating 2vs1 situations but their main tool to exploit a flank is not a fb, is a winger. Fb help but don't overlap all the time and are the main threat down that flank. This is what I see, what I've seen during decades and what anybody who watches the game can see. And they are facing very defensive teams. They unlock them down the flanks and score. It is not a major problem. You don't need supertalented players. It's very simple and usual. I don't know where are people from here, I don't know what football do you see, but what I'm explaining is the most normal way of playing. Do you remember? I've been sacked. 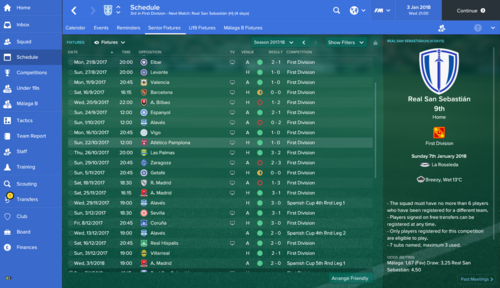 I lost 8 of the last 10 games, conceding 22 goals and scoring 16. But you have found the way to do it. The very fact that you win lots of games proves that. The issue is why you start losing games after a period of time and are unable to stop this decline. I'm confused, are you saying it is a problem with the positioning of the wide players in general, and thus is an issue with the game that people are glossing over? Or are you saying it's not the game's fault people are being too rigid tactically? You've bamboozled me mate! On FM, wide midfielders narrow in front of the goal eventually, so not having a wide back going all the way all the time means no passing lanes out wide. The game is uncomplete or wrong. You can't make your wingers to stay wide until they receive the ball. They narrow to open space for fullbacks (or other reasons), even using "stay wider" PI. That makes the game almost unplayable for me because I want to WIDE midfielders or WIDE wingers. I don't want my fb to exploit that space, I want my wingers. Edit: that doesn't explain why, suddenly, I start conceding an outrageous amount of goals. If you don't want your fullbacks overlapping your wingers, give them a role/duty that will stop that behaviour and make sure the players you pick in the position don't have PPMs such as Gets Forward Often. First of all, How I want to play? As I said, to exploit the space available in wide areas I need runners from deep. For that reason, I'll use wingbacks. Add to this that I want a solid defense and my options are quite reduced. This is a simple and visual way to know what I expect from each position. Goalie - Goalkeeper. Again, just a plain old fashioned 'keeper. No need for sweeper keepers as I don't plan on playing with a particularly high line. Wingbacks - Wb-at x 2. To be honest, this tactic starts and ends with these two players. They need to be ready to cover their flank and make forward runs to exploit the space available in wide areas. If they are not able to make forward runs or don't track back to defend, this tactic will totally fail. I need complete players here: players with good physical skills, dribbling, crossing, off the ball and good decisions to decide whether to stay back or run forward. Right Sided Midfielder - Box to box midfielder. The runner. I want him to make aggressive forward runs but also track back to defend. Break up attacks and score goals. Link between midfielder and strikers. Tackle and shot. A box to box. Central Midfielder - Central midfielder (defend). The sitter.The midfield destroyer. The intention here is for someone to actively get in the face of the opposition midfield to break up attacks. Left Sided Midfielder - Advanced Playmaker (support). This is my creator. I want him to be the focus to build attacks. I want him to attract the ball and make killer passes. Also some help when defending. Right Sided Striker - Deep Lying Forward (support). The "striker" that I want to provide a link to midfield. I want him to hold up the ball try risky passes and be a goal threat. Left Sided Striker - Advanced Forward. 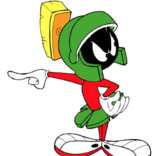 This is the spearhead of the attack, and I want him to be primarily goal focussed. I'm not sure about this role. I could use a p-at, but he is too static. In my opinion, mentality is totally situational. For that reason I'll leave it on Standard. To be honest, I don't fully understand the shape and its effects. As far as my knowledge can get, I use fluid shape if I don't have a playmaker (creative freedom) or I play a lone striker on attack duty (avoid isolation). On the contrary, if I have a playmaker and a 2 strikers tactic (or 1 striker on support) I use Structured shape. I know this is not 100% correct but neither 100% wrong (I hope). I think this tactic would be better suited with a Structured shape but I'll stay on flexible which is a neutral point. I will only use TI if they are needed and I understand what they mean. I don't know if I need TI yet, so no TI. I'll use Milan because I think there are many players that fit my style and I won't need a lot of transfers. I'll start the save on April 2017, so I can sign some free agents. Advanced Forward - Lapadula (I need a better striker). By all means go with the 3-5-2, and I hope you find success. You may not have found a way to do this, but that does not mean that FM is designed in that manner. I just wanted to clear that up for other readers. However, I think you have been doing it Looping, you perhaps don't realise it or are forgetting all the half seasons where you do actually win plenty of matches. Dunno. I don't know a side in football where the full backs, both of them aren't regularly involved in the final third, certainly not when they come up massed defenses in particular packing the central pitches. This is all about stretching the pitch, and I think there were complaints about the wingers before. Some would prefer them to sit out completely wide optionally at the corner flag, rather than eventually narrowing into the box, but that's not what is happening. Additionally if there is actual movement/overlaps, that makes things harder to defend full-stop. In motion that it is even more apparent than on still shots. Players will eventually try to put pressure on the ball carrier, so the more you stretch the pitch, the more they have to shift somewhere. Vice versa, the less they need to, the easier they'll get a foot in. There is points for either, however when trying to crack open massed defenses and open that scoring, the less of the former and the more of the latter, the less likely it is to score. This seems counter intuitive, but if an additionally player advances, the easier it also to keep the ball into the oppisition's third rather than losing it, an issue that AI tactics at their most rigidly defensive (sometimes still both fbs on d-duty staying all back completely plus several midfielders sitting behind the ball likewise) would also face. They can't keep the ball up-field for long for sure, which also has defensive ramifications. 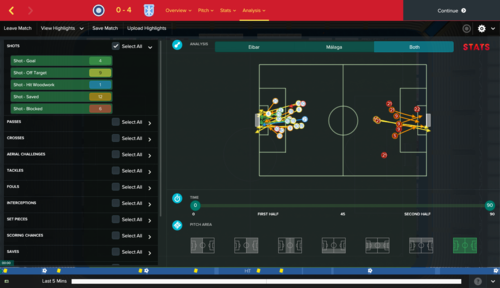 It's been a while, but I was facing a Poland national team AI on 2016 or 2015 that off a 4-3-3-ish) only ever advanced basically with the forward players, with 7 men basically sitting back. Easy to mop up and dispossess as they come. Not that I'm encouraging to emulate the AI here, as said, it's dynamic and shifts accordingly to goals scores conceded, but to understand that dynamics this causes on either end of the pitch.